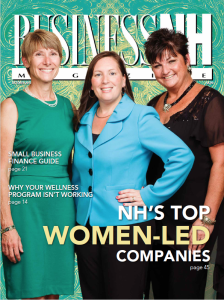 SmartATI was honored to be awarded the 2013 Fastest Growing Women-Led Business by the BusinessNH Magazine. The company experienced the fastest growth amongst other women-led businesses in NH. Lori Smart, President of SmartATI (pictured in the middle), has attributed the company’s success to her dedicated staff and continued focus on marketing their construction capabilities to federal customers. The company continues to see increased sales each year and is looking forward to reaching new heights!